The Last NBA Christmas Day slate between the Utah Jazz and Portland Blazers turns out to be a bit anti-climactic. Leading by 12 at Halftime, the Jazz never relented and pulled away for a 117-96 win over their Northwest Division rivals. As expected, the two backcourt stars, Damian Lillard and Donovan Mitchell, showed up; Mitchell put up 19 for the Jazz. Lillard finished with 20 points to lead the Blazers. Utah's supporting cast showed up, while Portland's did not. Seven players scored in double figures for the Jazz in the win. 1; even if it's only late December. Stuck down in 11th place – but less than four games out of a top four seed – in the crowded Western Conference, the jazz needed this in a big way against another team fighting for playoff positioning. Rudy Gobert is among the league's leading leaders. Hey what a shot-blocking machine in this game, finishing with a season-high seven rejections. Blazers' poor shooting, as they just went 35-of-89 from the field on the night. Gobert's seven blocks were just one of the shades of DeAndre Jordan's Christmas Day record of eight. Where were the other Blazers? Damian Lillard showed up for this game, leading the way as he has all season long. Though he was not at his most efficient, Lillard finished with 20 points, five rebounds and four assists. That was not enough though, the rest of the team did not show up. No one else scored more than 12 points, and CJ McCollum was disappointing. Lillard's backcourt mate put up just 11 points on 4-of-11 from the field. Damian Lillard and Donovan Mitchell are among the most exciting guards in the Western Conference. Things do not always work out as we expect, but on this night they pretty much did, as both of them played well. It was not an unforgettable showdown, but Lillard went for 20 points to lead the Blazers, while Mitchell had 19 of his own to pace the jazz. 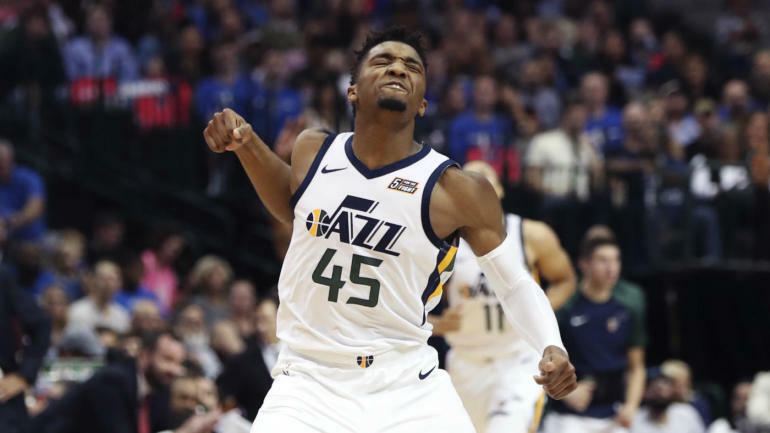 Rudy Gobert or Donovan Mitchell: The jazz do not really have a true star. Either way, they often need to operate as a unit, rather than relying on one or two players. In this win, they did just that. Led by 19 points from Mitchell and 18 from Gobert, seven different players scored in double figures. While the game itself was not much in the way for the second half, we did at least get a number of big highlights. First, Mitchell starts off the game with an incredible alley-oop – one of the best you'll see this season. Then there's Mo Harkless's slashing dunk past a late-arriving Gobert. Finally, Gobert threw a massive alley-oop of his own to close out the show.